Time: 1 hour. 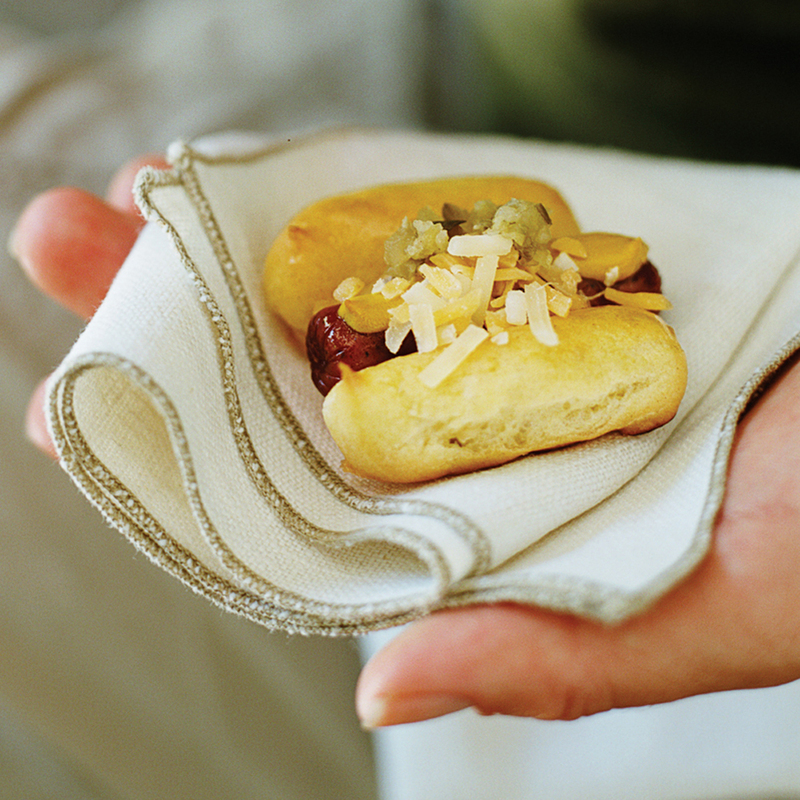 Hot dogs are mandatory at any ball game, and these mini versions are beyond cute. Pâte à choux (the same dough used for cream puffs) is quick and easy to make, but you'll need a little practice to pipe it neatly into hot dog bun shapes. Preheat oven to 400°. Coat 2 baking sheets with cooking-oil spray and line with parchment or waxed paper. Set aside. Transfer dough to a bowl of a stand mixer fitted with a paddle attachment. On low speed, add eggs 1 at a time, incorporating each before adding the next. Spoon dough into a large resealable plastic bag. Cut a corner of the bag to make a 1/2-in. opening. Gather bag above dough, twist, and push dough to opening. On the lined baking sheets, for each mini dog, pipe dough slightly apart into 2 parallel lines, about 2 in. long (the dough lines should be the same length as a mini frank and almost as thick). Then pipe a small amount of dough in center of both lines to create an H. Place a frank between the 2 long dough lines, pressing down slightly. Repeat with remaining dough and franks, spacing about 2 in. apart. Cool hot dogs until slightly warm, then squeeze a small ribbon of mustard onto length of each dog, top with a sprinkle of cheese, and spoon about 1/4 tsp. relish onto center. Make ahead: Prepare through step 4 and chill, covered, up to 1 1/2 hours prior to baking. Note: Nutritional analysis is per mini dog.